Protect your clothing against spills and stains with these dining bibs for the elderly (and disabled). Comfortable to wear, easy to put on and remove and with a waterproof backing, these adult bibs are ideal for situations where spillage is a possibility. 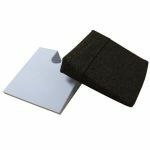 These comfortable waterproof cast and dressing protectors are easy to use and have a self-sealing band allowing them to be submerged. Simply slip over a cast or dressing on either the leg or arm to protect them whilst showering or bathing. The neoprene band has a wide area of contact and therefore does not pinch the skin or feel constrictive. The main body is made from a pliable waterproof PVC/nylon mesh, which is roomy and slip resistant. A great accessory for blue badge holders. This moulded plastic disabled flag lips over the edge of a car window to indicate to other car park users that disabled access is required, encouraging them not to park too closely. Simply slot the flag over the window edge and close the window to secure it into place. Coloured ferrules available in size 19mm (3/4"). Sold in pairs. Available in a chose of colours: Choose from, Blue, Green, Orange and Purple. Soft and comfortable PVC material provides a more secure grip when placed over pens and pencils. The flexible triangular shaped gripper fits easily over the pen or pencil to assist with stability when writing. Car steering wheel knob (mushroom type). Clamps easily to car steering wheel even those with air bags to assist turning of steering wheel. It can be transferred from car to car, by clamping easily onto steering wheel and provides easier steering control for increased maneuverability. Our luxurious fleece seatbelt pads provide protection from the seatbelt cutting and rubbing the shoulder. The velcro opening enables quick and easy fitting, the pad then slides into the required position. This stylish, discreet, and attractively upholstered commode looks neat and tidy enough to match any decor. The tasteful dark wood contrasts with a luxurious upholstery chair seat and back, and you'd never know from a glance that it's a commode at all. Inside, the commode pan is supplied with a lid for discreet transfer.